A Harvard botanist investigates mystic potions, voodoo rites, and the making of zombies. More than 30 years ago, anthropologist and ethnobotanist Wade Davis ’75, Ph.D. ’86, then a graduate student, went to Haiti at the recommendation of his mentor, Jeffrey professor of biology Richard Evans Schultes, to investigate a possible scientific explanation for the alleged existence of zombies. The January-February 1986 cover story about Davis’s findings, by Gino Del Guercio, prompted Yalie Garry Trudeau to create a zombie storyline for Doonesbury character “Uncle” Duke shortly thereafter, and remains one of the magazine’s most frequently requested articles. Five years ago, a man walked into l’Estere, a village in central Haiti, approached a peasant woman named Angelina Narcisse, and identified himself as her brother Clairvius. If he had not introduced himself using a boyhood nickname and mentioned facts only intimate family members knew, she would not have believed him. Because, eighteen years earlier, Angelina had stood in a small cemetery north of her village and watched as her brother Clairvius was buried. The man told Angelina he remembered that night well. He knew when he was lowered into his grave, because he was fully conscious, although he could not speak or move. As the earth was thrown over his coffin, he felt as if he were floating over the grave. The scar on his right cheek. he said, was caused by a nail driven through his casket. The night he was buried, he told Angelina, a voodoo priest raised him from the grave. He was beaten with a sisal whip and carried off to a sugar plantation in northern Haiti where, with other zombies, he was forced to work as a slave. Only with the death of the zombie master were they able to escape, and Narcisse eventually returned home. Legend has it that zombies are the living dead, raised from their graves and animated by malevolent voodoo sorcerers, usually for some evil purpose. 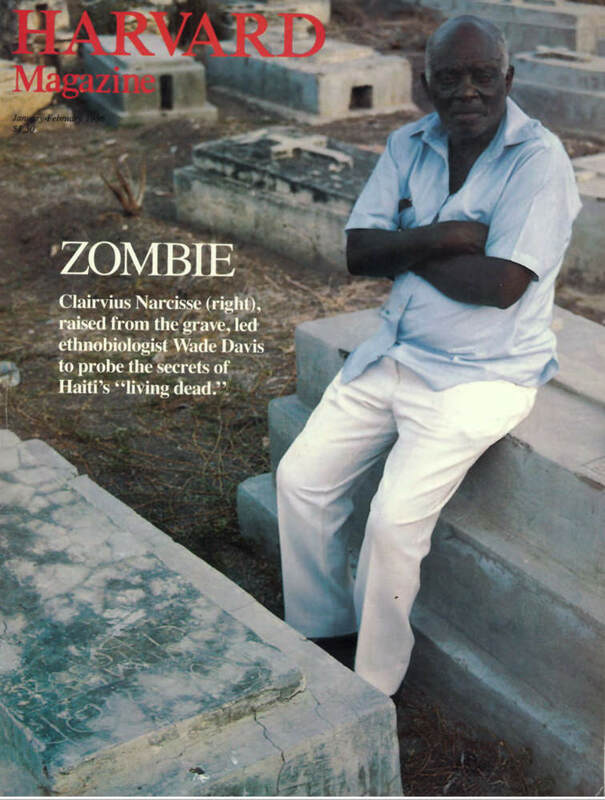 Most Haitians believe in zombies, and Narcisse’s claim is not unique. At about the time he reappeared, in 1980, two women turned up in other villages saying they were zombies. In the same year, in northern Haiti, the local peasants claimed to have found a group of zombies wandering aimlessly in the fields. But Narcisse’s case was different in one crucial respect; it was documented. His death had been recorded by doctors at the American-directed Schweitzer Hospital in Deschapelles. On April 30, 1962, hospital records show, Narcisse walked into the hospital’s emergency room spitting up blood. He was feverish and full of aches. His doctors could not diagnose his illness, and his symptoms grew steadily worse. Three days after he entered the hospital, according to the records, he died. The attending physicians, an American among them, signed his death certificate. His body was placed in cold storage for twenty hours, and then he was buried. He said he remembered hearing his doctors pronounce him dead while his sister wept at his bedside. At the Centre de Psychiatric et Neurologie in Port­ au-Prince, Dr. Lamarque Douyon, a Haitian­-born, Canadian-trained psychiatrist, has been systematically investigating all reports of zombies since 1961. Though convinced zombies were real, he had been unable to find a scientific explanation for the phenomenon. He did not believe zombies were people raised from the dead, but that did not make them any less interesting. He speculated that victims were only made to look dead, probably by means of a drug that dramatically slowed metabolism. The victim was buried, dug up within a few hours, and somehow reawakened. The Narcisse case provided Douyon with evidence strong enough to warrant a request for assistance from colleagues in New York. Douyon wanted to find an ethnobotanist, a traditional-medicines expert, who could track down the zombie potion he was sure existed. Aware of the medical potential of a drug that could dramatically lower metabolism, a group organized by the late Dr. Nathan Kline—a New York psychiatrist and pioneer in the field of psychopharmacology—raised the funds necessary to send someone to investigate. The search for that someone led to the Harvard Botanical Museum, one of the world’s foremost institutes of ethnobiology. Its director, Richard Evans Schultes, Jeffrey professor of biology, had spent thirteen years in the tropics studying native medicines. Some of his best­ known work is the investigation of curare, the substance used by the nomadic people of the Amazon to poison their darts. Refined into a powerful muscle relaxant called D-tubocurarine, it is now an essential component of the anesthesia used during almost all surgery. Schultes would have been a natural for the Haitian investigation, but he was too busy. He recommended another Harvard ethnobotanist for the assignment, Wade Davis, a 28-year-old Canadian pursuing a doctorate in biology. Davis took a course from Schultes, and when he decided to go to South America to study plants, he approached his professor for guidance. “He was an extraordinary figure,” Davis remembers. “He was a man who had done it all. He had lived alone for years in the Amazon.” Schultes sent Davis to the rain forest with two letters of introduction and two pieces of advice: wear a pith helmet and try ayahuasca, a powerful hallucinogenic vine. During that expedition and others. Davis proved himself an “outstanding field man,’’ says his mentor. Now, in early 1982, Schultes called him into his office and asked if he had plans for spring break. “I always took to Schultes’s assignments like a plant takes to water,” says Davis, tall and blond, with inquisitive blue eyes. “Whatever Schultes told me to do, I did. His letters of introduction opened up a whole world.” This time the world was Haiti. Davis knew nothing about the Caribbean island—and nothing about African traditions, which serve as Haiti’s cultural basis. He certainly did not believe in zombies. “I thought it was a lark,” he says now. Davis landed in Haiti a week after his conversation with Schultes, armed with a hypothesis about how the zombie drug—if it existed—might be made. Setting out to explore, he discovered a country materially impoverished, but rich in culture and mystery. He was impressed by the cohesion of Haitian society: he found none of the crime, social disorder, and rampant drug and alcohol abuse so common in many of the other Caribbean islands. The cultural wealth and cohesion, he believes, spring from the country’s turbulent history. Davis discovered that the vast majority of Haitian peasants practice voodoo. a sophisticated religion with African roots. Says Davis, “It was immediately obvious that the stereotypes of voodoo weren’t true. Going around the countryside, I found clues to a whole complex social world.” Vodounists believe they communicate directly with, indeed are often possessed by, the many spirits who populate the everyday world. Vodoun society is a system of education, law, and medicine: it embodies a code of ethics that regulates social behavior. In rural areas, secret vodoun societies, much like those found on the west coast of Africa, are as much or more in control of everyday life as the Haitian government. Although most outsiders dismissed the zombie phenomenon as folklore, some early investigators, convinced of its reality, tried to find a scientific explanation. The few who sought a zombie drug failed. Nathan Kline, who helped finance Davis’s expedition, had searched unsuccessfully, as had Lamarque Douyon, the Haitian psychiatrist. Zora Neale Hurston, an American black woman, may have come closest. An anthropological pioneer, she went to Haiti in the Thirties, studied vodoun society, and wrote a book on the subject, Tell My Horse, first published in 1938. She knew about the secret societies and was convinced zombies were real, but if a powder existed, she too failed to obtain it. Davis obtained a sample in a few weeks. He arrived in Haiti with the names of several contacts. A BBC reporter familiar with the Narcisse case had suggested he talk with Marcel Pierre. Pierre owned the Eagle Bar, a bordello in the city of Saint Marc. He was also a voodoo sorcerer and had supplied the BBC with a physiologically active powder of unknown ingredients. Davis found him willing to negotiate. He told Pierre he was a representative of “powerful but anonymous interests in New York,” willing to pay generously for the priest’s services, provided no questions were asked. Pierre agreed to be helpful for what Davis will only say was a “sizable sum.” Davis spent a day watching Pierre gather the ingredients—including human bones—and grind them together with mortar and pestle. However, from his knowledge of poison, Davis knew immediately that nothing in the formula could produce the powerful effects of zombification. Three weeks later, Davis went back to the Eagle Bar, where he found Pierre sitting with three associates. Davis challenged him. He called him a charlatan. Enraged, the priest gave him a second vial, claiming that this was the real poison. Davis pretended to pour the powder into his palm and rub it into his skin. “You’re a dead man,” Pierre told him, and he might have been, because this powder proved to be genuine. But, as the substance had not actually touched him, Davis was able to maintain his bravado, and Pierre was impressed. He agreed to make the poison and show Davis how it was done. The powder, which Davis keeps in a small vial, looks like dry black dirt. It contains parts of toads, sea worms, lizards, tarantulas, and human bones. (To obtain the last ingredient, he and Pierre unearthed a child’s grave on a nocturnal trip to the cemetery.) The poison is rubbed into the victim’s skin. Within hours he begins to feel nauseated and has difficulty breathing. A pins-and-needles sensation afflicts his arms and legs, then progresses to the whole body. The subject becomes paralyzed; his lips turn blue for lack of oxygen. Quickly—sometimes within six hours—his metabolism is lowered to a level almost indistinguishable from death. As Davis discovered, making the poison is an inexact science. Ingredients varied in the five samples he eventually acquired, although the active agents were always the same. And the poison came with no guarantee. Davis speculates that sometimes instead of merely paralyzing the victim, the compound kills him. Sometimes the victim suffocates in the coffin before he can be resurrected. But clearly the potion works well enough often enough to make zombies more than a figment of Haitian imagination. Analysis of the powder produced another surprise. “When I went down to Haiti originally,” says Davis, “my hypothesis was that the formula would contain concombre zombi, the ‘zombie’s cucumber,’ which is a Datura plant. I thought somehow Datura was used in putting people down.” Datura is a powerful psychoactive plant, found in West Africa as well as other tropical areas and used there in ritual as well as criminal activities. Davis had found Datura growing in Haiti. Its popular name suggested the plant was used in creating zombies. One of the ingredients Pierre included in the second formula was a dried fish, a species of puffer or blowfish, common to most parts of the world. It gets its name from its ability to fill itself with water and swell to several times its normal size when threatened by predators. Many of these fish contain a powerful poison known as tetrodotoxin. One of the most powerful nonprotein poisons known to man, tetrodotoxin turned up in every sample of zombie powder that Davis acquired. Numerous well-documented accounts of puffer fish poisoning exist. but the most famous accounts come from the Orient, where fugu fish, a species of puffer, is considered a delicacy. In Japan, special chefs are licensed to prepare fugu. The chef removes enough poison to make the fish nonlethal, yet enough remains to create exhilarating physiological effects—tingles up and down the spine, mild prickling of the tongue and lips, euphoria. Several dozen Japanese die each year having bitten off more than they should have. Davis was certain he had solved the mystery. But far from being the end of his investigation, identifying the poison was, in fact, its starting point. “The drug alone didn’t make zombies,” he explains. “Japanese victims of puffer-fish poisoning don’t become zombies, they become poison victims. All the drug could do was set someone up for a whole series of psychological pressures that would be rooted in the culture. I wanted to know why zombification was going on,” he says. Gathering poisons from various parts of the country, Davis had come into direct contact with the vodoun secret societies. Returning to the anthropological literature on Haiti and pursuing his contacts with informants, Davis came to understand the social matrix within which zombies were created. Davis’s investigations uncovered the importance of the secret societies. These groups trace their origins to the bands of escaped slaves that organized the revolt against the French in the late eighteenth century. Open to both men and women, the societies control specific territories of the country. Their meetings take place at night, and in many rural parts of Haiti the drums and wild celebrations that characterize the gatherings can be heard for miles. Davis believes the secret societies are responsible for policing their communities, and the threat of zombification is one way they maintain order. Says Davis, “Zombification has a material basis. but it also has a societal logic.” To the uninitiated, the practice may appear a random criminal activity, but in rural vodoun society, it is exactly the opposite—a sanction imposed by recognized authorities, a form of capital punishment. For rural Haitians. zombification is an even more severe punishment than death, because it deprives the subject of his most valued possessions: his free will and independence. The vodounists believe that when a person dies, his spirit splits into several different parts. If a priest is powerful enough, the spiritual aspect that controls a person ‘s character and individuality, known as ti bon ange, the “good little angel,” can be captured and the corporeal aspect, deprived of its will, held as a slave. Davis has not been able to discover how prevalent zombification is in Haiti. “How many zombies there are is not the question,” he says. He compares it to capital punishment in the United States: “It doesn’t really matter how many people are electrocuted, as long as it’s a possibility.” As a sanction in Haiti, the fear is not of zombies, it’s of becoming one.